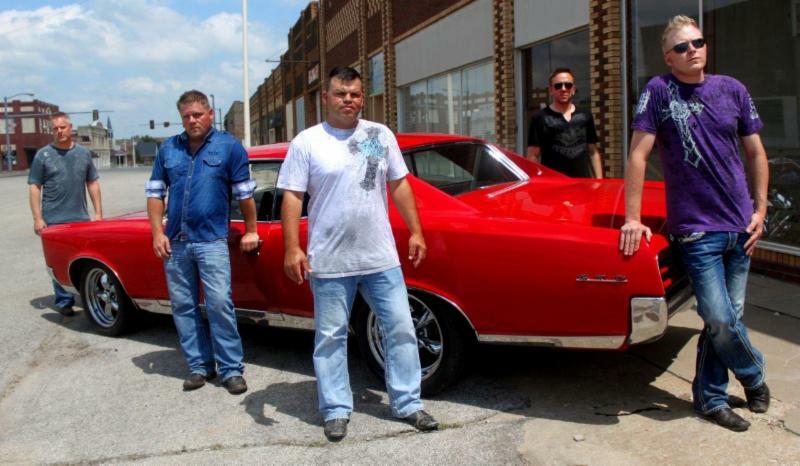 Billboard to World Premiere LiveWire Video for "Drivin' You Outta My Mind"
(Nashville, TN) July 23, 2014 - Country group, LiveWire, releases the video today for their current single, "Drivin' You Outta My Mind." Billboard.com is hosting the world premiere of the video at this link. The video was filmed, produced and directed by the team of noted Nashville videographer Flick Wiltshire (Tracy Lawrence/Alan Jackson) and Clif Doyal for Way Out West Records. The beautiful red rock buttes and mesas of the Gloss Mountains combined with the desolate sand dunes of the Little Sahara State Park in western Oklahoma provided the perfect locations to capture the band's performance. The stunning visuals, accompanied by the haunting lyrics of the up-tempo single, "Drivin' You Outta My Mind," take the listener on a fast ride through the wide open West. Adding to the eye-popping appeal of the clip is a candy apple red 1967 GTO that was customized specifically for use in the video by Dangerous Motors of Cushing, OK.
"Drivin' You Outta My Mind" is currently Top 40 on both the Texas Music Chart and the Texas Regional Radio Report and is climbing the MusicRow chart. Critical acclaim for the single has been very strong, including Music News Nashville who raved "This very well might be the cut that - to quote the Doors - pushes them on through to the other side!" LiveWire continues its "Drivin' You Outta My Mind Tour" with a performance this Saturday (7/26) at the Boone County Fair in Columbia, MO. The video for "Drivin' You Outta My Mind" can also be downloaded by music industry and media at CD Tex: http://www.cdtex.com/mds_video_livewire.htm. Edgy, honest and passionate, LiveWire's unique sound blends elements of working man's Country and rootsy Southern Rock. The band's music has found success at Country radio, both in the U.S. and in Europe, and their videos have received airplay on CMT Pure, ZUUS Country, The Nashville Network and Yallwire. Major media outlets including Billboard, MusicRow, Roughstock, Music News Nashville, the Texas Music Chart, Maverick, and many others have all touted LiveWire's talents. The group's reputation as a top-shelf live act has been honed by opening for, and performing on the same bill with, Toby Keith, LeAnn Rimes, Mark Chesnutt, Kix Brooks and Texas/Red Dirt artists Cody Canada and The Departed, Casey Donahew Band, Kyle Park, Brandon Jenkins and Bo Phillips, among many others. The band has performed across America and on the hallowed stage of The Ryman Auditorium in Nashville as national finalists in the 2009 Colgate Country Showdown. LiveWire released a self-titled EP in 2011 which included its debut radio hit single, "Tater Fed." After signing with Way Out West Records, LiveWire released a video for "Tater Fed" and a single and video of "Miracle Of The Human Spirit," which benefited the group's storm-ravaged hometown of Joplin, Mo., struck by an EF-5 tornado in the spring of 2011. LiveWire released its debut album LIVIN' on Way Out West in late 2012. The critically-acclaimed album produced the hit singles "Lies" and "Whiskey Sunday." Way Out West Records is an independent record label which maintains offices in Nashville and Oklahoma. Since its founding in 2008, Way Out West has placed singles by LiveWire and label co-founder Shawna Russell on MusicRow, Billboard "New and Active," Texas Music Chart, Texas Regional Radio Report and European charts. For more information, click here: www.wayoutwestrecords.net.